Carving a narrow space into an even smaller section, a sense of cleanness pervades, attuned to the definition of its own periphery. Protection and limitation co-exist here within the context of purification. This is a workshop, an operating room, a production line. The gleam of metal signals to the process of mass transformation beyond the ordinary objects; their dissected vestige reconfigured and sealed in its own place. Here, the word “organize” connotes a sinister intention, justified by the act of “cleaning”. Face to face with viewers as witnesses, at the end of the path, is a reminder of our returns to things appearing other than as we know them, nevertheless, they remain inconsequential. Ko Sin Tung was born in 1987. She lives and works in Hong Kong. With a focus on elements related to city life, such as man-made objects, constructions, images with symbolic significance, etc, she uses a wide range of media to reflect the false hopes created by authoritative parties in social and living aspects. 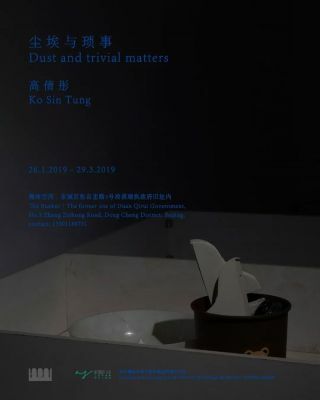 Her work has been exhibited at Hong-gah Museum, Taipei(2018); Tai Kwun Contemporary, Hong Kong(2018); Centre for Chinese Contemporary Art, Manchester(2017). She was awarded the Special Jury Prize of Huayu Youth Award(2016); Pure Art Foundation Grant(2013-2014);Project Grant (Emerging Artists Scheme) from the Hong Kong Arts Development Council(2014).